Welcome to Susan Taylor's Real Estate Resource for New York's Greater Hudson Valley! Whether you are interested in Newburgh, Middletown, Montgomery, Walden, and Wallkill in Orange County, or Monticello, Bloomingburg, Rock Hill, and Wurtsboro in Sullivan County, Susan will help you find what your looking for. View the Hudson Gateway MLS on my realestate website! If you are planning to buy or sell real estate in Orange, Ulster, or Sullivan County, let Susan Taylor use her unique real estate system to help you find what you are looking for. Her upbeat personality, coupled with her use of the latest technology, makes Susan the best choice for all of your real estate needs. Click here to find out what's happening in your neighborhood! The Hudson River Valley is one of the most beautiful areas in all of New York State. With its' spectacular mountain vistas and majestic fall foliage, there is a scene that will excite you just around the corner. Sports enthusiasts enjoy year round activities such as fishing, skiing, snowmobiling, hiking, river rafting, and, of course, golf. The Hudson Valley is rich in history and offers a vast array of cultural activities. From museums to festivals, and close proximity to New York City, the Hudson Valley has it all. As a service, Susan has put together this Web site filled with valuable information to help answer questions for both buyers and sellers. Please give her a call or e-mail her at realestate@susantaylor.net . With Susan on your side you are sure to make the most of your move to, from, or around the Hudson Valley. 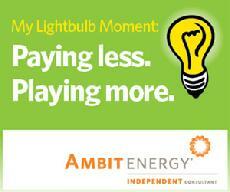 Ambit Energy offers you an income opportunity like no other. Take control of your financial future. As an Ambit Energy Independent Consultant, you can make money by helping people save money on products they have to buy every month—electricity and natural gas.